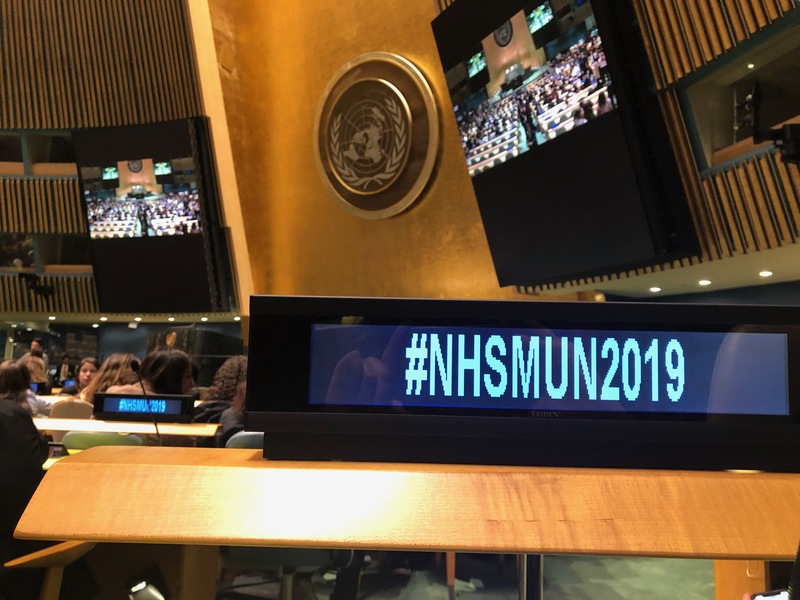 Over 5,000 high school students from over 75 countries gathered in the heart of New York City to attend the 45th National High School Model United Nations Conference (NHSMUN) from March 1-8. These eight days were divided into two separate sessions, with each session hosting delegates from all over America, Europe, Latin America, Asia and even part of Africa. For those not familiar with Model UN, a conference is a simulation of the diplomatic debate that occurs in the United Nations. Delegates get to play specific countries and debate from those country’s policies in committees such as UNESCO, ECOFIN, UNDP, Security Council etc. These different countries then work together to form a resolution which aims to find various solutions to the issue at hand. The different resolutions will be further debated, amendments will be added and then the committee as a whole will vote to either pass or fail a resolution. During NHSMUN, delegates worked with multifaceted topics spanning from asymmetric warfare in South Asia to combating violence against indigenous women. The conference itself lasted four days with committee sessions often being four to five hours at a time. Most Model UN Conferences are one or two days, which is why NHSMUN was a completely different experience. Usually during Model UN conferences, delegates debate issues that occur in other countries such as the eurozone crisis, or other humanitarian issues that do not have much effect on Californians or even Americans. However, at NHSMUN, the perspectives of solutions is vastly broadened as there were delegates from those very countries who were able to recount on their personal experiences and from there everyone worked collaboratively to resolve issues in a practical and effective way. NHSMUN was a completely eye-opening experience where I was able to work with people from other cities, states and even countries. I was exposed to viewpoints from around the world on topics such as the role of the Internet in Transnational Organized Crime or the prevention of AIDS in Sub-Saharan Africa. Living in Southern California, you often forget that there’s a whole world out there and NHSMUN 2019 was a completely authentic experience where delegates were able to truly emulate their own “Model” of the UN.